The crystal blue waters, soft white sand beaches and chill vibe beckon travelers to visit the Caribbean extending the summer into fall, before the rush of the high season crowds offering lower rates and fantastic deals. 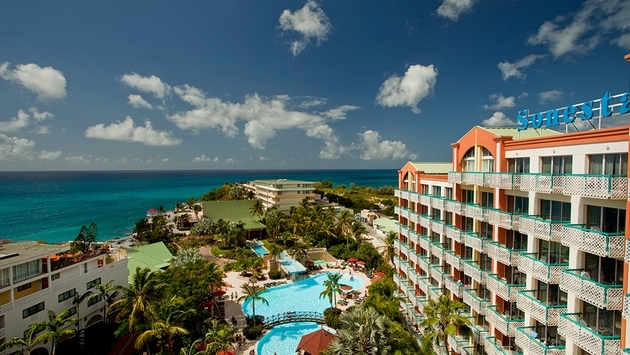 Resorts like Sonesta Collection in Sint Maarten make it easy and affordable to book a last minute trip, offering the “Fall into Savings” package at both the limitless all-inclusive family-friendly Sonesta Maho Beach Resort & Casino and the limitless all-inclusive adults-only Sonesta Great Bay Beach Resort Casino & Spa. “We noticed guests were making plans for the summer less in advance compared to last year. We started seeing a slower pace in May and June for July and August travel, and only recently began to pick up for summer vacation which would typically happened about 3-4 weeks earlier,” says Eliska Hesova, Director of Business Development for Sonesta Collection Sint Maarten. These stunning beachfront resorts are offering couples, families and friends added incentive with free nights and resort credits for bookings now through Sept. 30, 2014 for travel through Dec. 18, 2014. Families booking a minimum three nights at Sonesta Maho Beach Resort & Casino receive a third night free plus $200 resort credits. Kids 12 years and under stay, play and eat free and kids 13-17 years stay, play and eat for just $45 per day. Couples and adults booking a minimum four nights with the “Fall into Savings” package at Sonesta Great Bay Beach Resort Casino & Spa will receive their fourth night free plus $300 in resort credits to be applied at the Serenity Spa manager's wine list, a romantic dinner and at the resort's gift shop. Reservation must be fully prepaid and are non refundable. Not valid for groups and based on availability. Guests can use promo code SP50AI when booking by phone at 1-800-SONESTA (766-3782), or visit www.sonesta.com/mahobeach and www.sonesta.com/greatbay for more information. Eliska Hesova is the Director of Business Development for Sonesta Collection Sint Maarten.